Dubai, UAE - October 23rd 2018 - The European Tour and Tata Communications have completed the world’s first test of live 360° video in 8K Ultra High Definition – the highest resolution in digital television today. 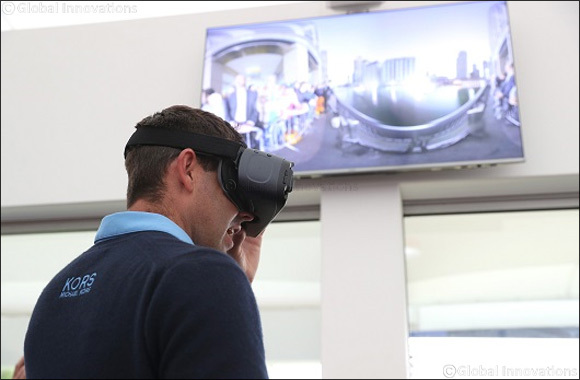 The ground-breaking technology test at Sky Sports British Masters shows how the most immersive 360° video and virtual reality (VR) applications could enable fans at home and at the course to engage with the action in new ways. The world-first live 360° video feed in 8K was captured on the 18th hole of the Walton Heath Golf Club course, where fans were able to enjoy the action on a large screen, with VR headsets for a personalised viewing experience. The feed was live transcoded by Visbit, using the company’s View-Optimized Streaming (VVOS) technology. This solution saves up to 80% of bandwidth, enabling the streaming of data-intensive UHD 8K video over a regular Internet connection. The 8K signal was delivered over Tata Communications’ ultra-low-latency Video Connect network and played on the Visbit 8K Live Player app on Samsung Gear VR headsets with Samsung Galaxy S9 smartphones. The 8K capturing and real-time stitching solution for the proof-of-concept was supplied by Kandao, whose Obsidian 8K VR camera uses six 4K lenses to capture the course from every angle.